The two-party system in America can be suspect for those looking to see new issues at the political forefront. Yet Democrats and Republicans generally stick to their road map, and those who stray risk losing crucial party support. Nonetheless, several politically passionate Vermonters chose to run as independent or alternative party candidates. Charles Laramie, of Fair Haven, is running for governor as an independent. 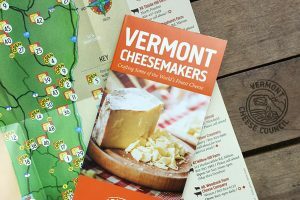 “There is a movement beginning to sweep Vermont and the Nation. 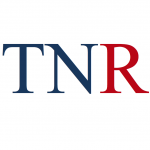 This movement has people realizing that the two-party system is broken and there are other alternatives; that Independents only answer to the voter and common sense,” Charles Laramie, an independent candidate for governor, wrote last month in a press release. Laramie is a retired teacher from Fair Haven who feels the education system is severely letting down students. Some of his other positions include raising the minimum wage and developing a universal health care system. According to a Gallup poll, the number of Americans identifying as independent rose from 39 to 42 percent between 2016 to 2017. As of 2014, according to the Pew Research Center, 14 percent of Vermonters claimed to have no political leanings towards Republicans or Democrats. Neil Johnson, a resident of Waitsfield, and a candidate of the Green Mountain Party, has thrown his hat in the ring as well. The Green Mountain Party is essentially an independent party that attempts to focus on solutions not currently adopted by the major parties. “On some issues certainly [we lean right], and on other issues we have people calling us a progressive party,” Johnson said. For instance, Johnson has new ideas for affordable housing. He’s convinced that if zoning requirements are relaxed, truly affordable home-ownership is within reach. Neil Johnson, of Waitsfield, is running for state House in the Washington-7 district. He’s suspicious of current affordable housing programs, which, according to one real estate developer, can costs taxpayers upward of $500 per square foot. “There’s some stuff that doesn’t look right — zero-interest loans and loans being relieved debt-free, and all this kind of stuff. There are some shenanigans going on,” Johnson said. He’d also like to see Vermont’s education system shrink a few sizes. Johnson estimates that Vermont overspends on school administration by about two-fold. Mason Wade, of Rochester, is another independent who is running for Senate, in Windsor County. He says the major parties are ruining Vermont. 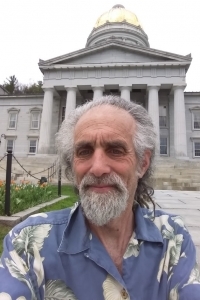 Mason Wade, of Rochester, is an independent candidate for the Vermont Senate. 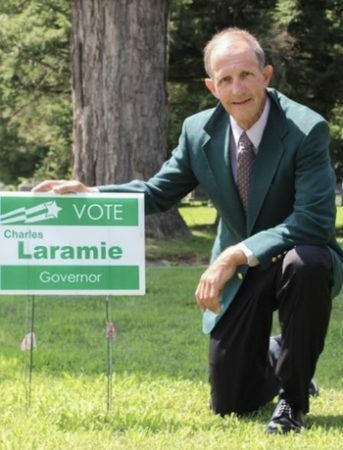 He expressed frustration that Laramie was not included in the gubernatorial debates. 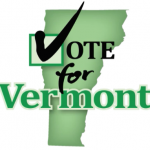 When it comes to the big campaign issue, he’s all about making Vermont more affordable. Wade said it’s time to downsize school governance. Another initiative Wade advocates for is to have credit unions get involved in promoting electric car ownership. Beverly Stone, an independent candidate for state Senate to represent the Windham District. 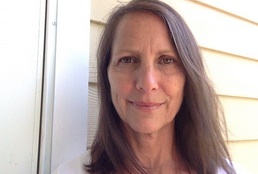 Down in the Windham District, another independent candidate, Beverly Stone, of Brattleboro, is seeking a seat in the state Senate. She added that the downside, however, is the lack of physical and financial support. Also, minor party candidates don’t get much attention from the media. Regarding campaign issues, on health care Stone is in favor of an “open-market system” free of state borders. On education, she wants to see more physical activity and nature instruction, and less standardization. Good luck Neil, you certainly have a message that resonates with many folks, I only wish we could of stayed in VT to see you win. We had to move on to greener pastures where the Jobs are and the lowers taxes and fees are. It was a hard decision but waiting for VT to get it’s head out of the sand wasn’t a risk we were willing to take. For instance, look at BLS Jobs data: At the low in 2009 VT had non farm wage and employment of ~295k and nearly 10 years later VT has ~313k. About 6% increase. Take NH at 620k to 690k. About double VT’s job growth at 11%. I neglected to add, that then VT kicks you in the groin as you are finally leaving the state. Make sure you sell your house before you leave for a better job. We didn’t and got handed a 2.5% EXIT TAX on the price of the home that I built with my bare hands. Talk about adding salt to the wound. Thanks for the kind words and support, it’s much appreciated. Independents accomplish only one thing. They split the conservative vote and guarantee the election of lib/prog/dems. Well in our area we have no Republicans running. There are many areas in that state where there are no Republicans running, please explain how we’d negatively affect those areas. Thanks for covering our story, we haven’t been able to get any coverage in other papers & new sources despite many requests. You’d think they would at least want to tell us how bad we are, the young man who was 13 and will say very well spoken got all sorts for free press across the state and nation. the three white elephants our leaders continually ignore. We look to have Term Limits, Eliminate or Tax the PAC’s and Lobbyists, Bring our Ethics grade from one of the lowest in the nation to the highest (D- to A+, it’s our logo). 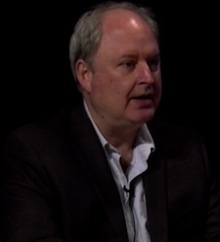 Affordability has many facets, $95/wk day care, becoming a destination education state with associate professor pay double/tripled while reducing the cost for college class by 70%, affordable home ownership at $600 per month (interest rates are creeping up), good paying jobs, education in finance/business and family planning to stop generational poverty. Our drug problem is epic, we were leading the nation in addicted births. 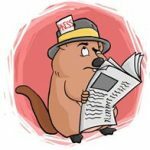 We have many people interested in possibly joining for 2020, everyone is curious to see how we do in our local race, which suddenly is filled with PAC, Lobbyist and well connected people funding the standard candidates. We really don’t want any money at this point, we just need for people to share our videos, website on Front Porch Forum or in emails. It’s local new sources like this the really investigate and inform the public to what is going on. The Waterbury record also did a fabulous story on all the local candidates without the programmed questions. Thanks again. Local debate on Mad River TV, also many interview on Today Lights Tomorrow.